A Candlewood Lake Wedding Photo is defined by the happy tranquility that always seems to vibrate from the images taken by the waters of the lake. Candlewood Lake is the largest man-made lake in Connecticut. Once acres of farmland, the lake was created by the Army Corp. of Engineers and the Connecticut Light and Power Company to be used to generate hydroelectric energy in the 1920s. Since that time the lake has become a popular spot for both locals and visitors to enjoy regardless of the season. This Candlewood Lake Wedding Photo shows a couple and their guests celebrating on the waters of the lake after a summer wedding ceremony. The newlyweds and their guest stand on boats that float on the serene Candlewood Lake waters. The bride and groom have a boat that is just for the two of them, and for their baby daughter who joined them on this special day. The little family watches joyfully as their friends and family revel in the casual atmosphere and cooling waters of the lake. The water glistens in the afternoon sunlight and guests relax in lake appropriate attire. One guest, a groomsman, donned his bathingsuit and surprised the couple by jumping onto their boat and then belly-flopping into the water. 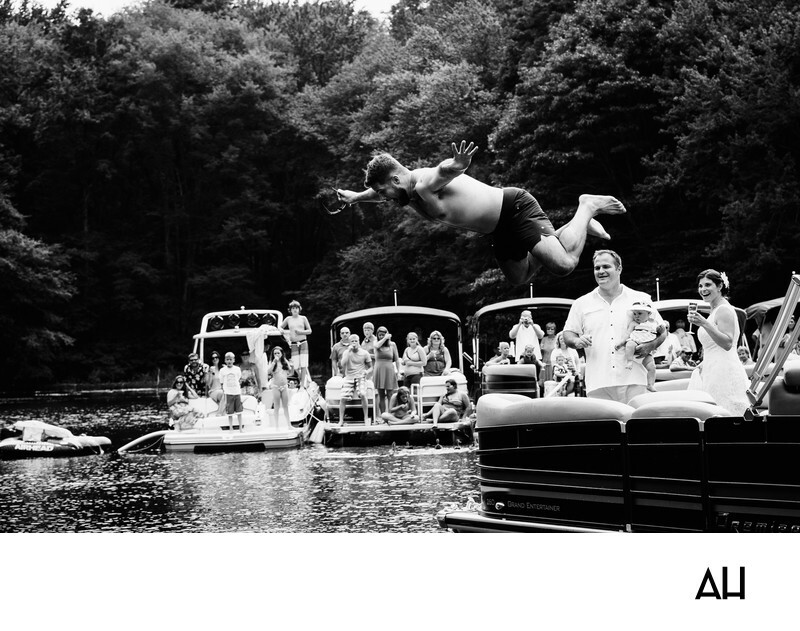 I snapped this photograph the moment the groomsman jumped from the edge of the boat and spread his arms wide in the air. The result was a picture that truly captured the fun-loving nature of the couple and of those closest to them.